Hi. Scons can't find the compiler. Unknown compiler on platform win32. How I can repair this mistake? then I get 2 errors. /D_UNICODE   /I..\..\lib\vc11_lib\mswud /I..\..\include  /W4  /DWXBUILDING /I. .\..\src\tiff\libtiff /I..\..\src\jpeg /I..\..\src\png  /I..\..\src\zlib /I..\..
VC\BIN\cl.EXE" : return code "0x2"
The error in your first message is because our SCons script doesn't support Visual Studio 2013 / 12.0 yet (but this can easily be fixed). 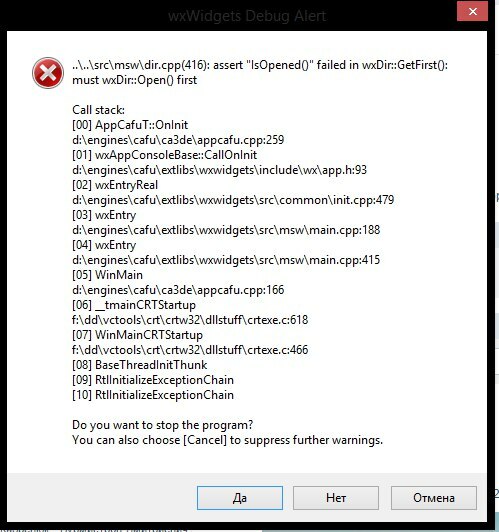 The error in your second message is because with Visual Studio 2012 / 11.0, something seems wrong with your configuration, so that the Windows SDK cannot be found. This might be a consequence of having VS 12.0 installed next to 11.0. Which editions of Visual Studio do you have? Express or "full"? Right now, I'm downloading and insalling Visual Studio 12.0, will fix the support in our build scripts, then post here again, later today. I have full version of VS2013. ok, I made the promised changes, please pull from the Git repository. Using Visual C++ 2013 (12.0) Express Edition, I've been able to run clean builds both for 32- and 64-bit targets. in order to clean fragments from previous builds using Visual C++ 11.0.
in order to clean fragments from previous builds using Visual C++ 12.0 (which should be auto-detected, as no value for MSVC_VERSION is provided). should compile everything, using 32-bit targets (recommended). if you have at least a Quad-Core. This is much faster than without -j 4, but may fail. If it fails, you can still re-run without -j 4. And if do this in release version then I get only second message. Are you running Cafu.exe from the right working directory?